Seattle Mayor Ed Murray’s security detail while doing city business and sightseeing in Israel cost taxpayers. He says the trip was worthwhile and Police Chief Kathleen O’Toole says she takes his protection very seriously. Before the official business of his mission to Israel in June began, Seattle Mayor Ed Murray spent a few days sightseeing. And while he played tourist, Seattle Police Department (SPD) officers were watching his back. Murray had SPD security guards with him throughout his time in Israel, earlier this year in Ireland on official business and on an official trip to the Vatican last month because Police Chief Kathleen O’Toole has put together a robust executive-protection plan that includes consulting with federal officials when the mayor travels abroad, O’Toole says. The precautions come at a cost to taxpayers: SPD spent about $20,000 to have two officers accompany Murray to Israel for two weeks, including about $6,500 before the mayor’s official business started, according to records obtained by The Seattle Times. But Murray says the trip was worthwhile. He spoke at a conference on LGBT rights in Tel Aviv, met with Palestinian students and a prominent Palestinian official in the West Bank, and talked with the mayors of Jerusalem, Tel Aviv and Beersheva. He also spent time with Shimon Peres, a former president of Israel, and with Israeli business owners, including several involved the country’s healthy tech-startup scene. And O’Toole, who in previous jobs oversaw security for a Massachusetts governor and a Boston mayor, and who has worked in Ireland, says she considers the mayor’s well-being her personal responsibility and would rather be safe than sorry. 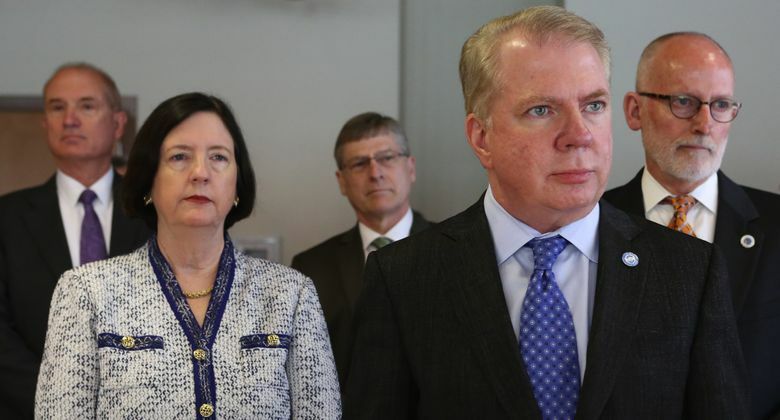 “When I first came on board, during the early months of the mayor’s term, (the administration) really didn’t have a comprehensive plan, and that concerned me,” said the chief, whom Murray nominated in May 2014, about five months after he took office. When Murray leaves the country, SPD may confer with Secret Service, FBI and State Department officials. The department formulates a unique strategy for each trip. The department makes no distinction between the mayor’s official and unofficial business, so he may receive protection on vacations, O’Toole says. “Whether on-duty or off-duty, we make our determination based on need,” she said. Murray may have blended in at times with the tourist crowds as he made his way through Jerusalem. But he was a visiting American dignitary, O’Toole stresses. Murray hopes Israeli startups will consider doing business here. Tel Aviv’s mayor and a Palestinian business group plan to visit Seattle, and Palestinian official Saeb Erekat has invited Seattle to enter a sister-city relationship with the West Bank, Murray says. “People do business with people they know, and us being there and people there getting to know Seattle will have long-term benefits,” he said. A spokesman for New York City Mayor Bill de Blasio declined to comment on de Blasio’s overseas-security policy. Representatives for the mayors of San Francisco, Denver and Portland didn’t return requests seeking comment about their security. O’Toole says Murray, who served in the Legislature for almost 20 years before becoming mayor, was initially uncomfortable with the level of protection she ordered. But Murray in recent months has “resigned himself to the fact that security professionals should make the calls, not political advisers,” O’Toole says. SPD spent about $700 per day on each of Murray’s security guards while they were in Israel, records show. He noted he doesn’t decide when he needs protection. When asked directly whether he considers those costs when he makes vacation plans, he declined to comment. The cost of the Israeli mission for Murray, his husband and the officers, along with two Fire Department officials and a staff member from the mayor’s Office of Intergovernmental Relations (OIR), totaled about $50,000. Seattle taxpayers paid for the officers and Fire Department officials and covered most expenses for the OIR staff member — a total of about $36,000. The Israeli Ministry of Foreign Affairs, Trade Development Alliance of Greater Seattle, the first couple and Murray’s office fund paid the remainder — a total of about $15,000. The office fund, used by mayors for some travel and other quasi-governmental activities, is made up of contributions from private donors. The Fire Department officials made the trip to learn from Israeli counterparts about responding to large-scale emergencies.